Thanks Ottawa for voting Canadian Canine as your #1 Choice for Ottawa's Best Dog Obedience Training School. Welcome to Ottawa Dog Obedience Training Headquarters where the trainers come to train. At Canadian Canine Training Academy you can learn to train your dog to be a well behaved family companion from any one of our team of professionals all over eastern Ontario. We have trainers who specialize in dog aggression. Click on the picture and have a look at what we can do. Our trainers don't just train dogs. They teach dog owners how to understand their dog’s behaviour and how to develop a positive relationship between the owner and their dog based in mutual trust and respect. When we say "We can train ANY DOG" we really mean any dog. Our training techniques work with all dogs. The reason for this is simple. We do a thorough evaluation with every dog we work with to determine the cause of the behaviour then we can recommend the best way to correct the unwanted behaviour at the source. Anything less is just treating the symptoms. The purpose of the evaluation is for us to determine the cause of your dog's behaviour so we can make recommendations on what needs to be done to help you meet your training goals. Because every dog is different, their problems and causes for problems will vary, and so will the treatment depending on the nature of the dog's behaviour. This process is quite simple. First click on the Free Training Evaluation, select a trainer and submit the information required. A professional trainer will review the information to get a good idea of your case. You will then be contacted to make an appointment to see the trainer so we can meet with you and your have a look at your dog. When the evaluation of your dog's temperament and degree of socialization is done, your trainer will provide you with a copy of your evaluation, complete with comments and training recommendations. We would like to thank Randy Chartrand and Canadian Canine Academy for saving our dog Zorro. We got Zorro as a puppy when he was 2 months old. We had just lost our three year old dog Lilly. She had auto immune hemolytic anemia and died at home suddenly in our arms. We were incredibly heartbroken and grief stricken, and knew we would need an animal to help heal. We decided on Zorro an adorable Siberian Husky. He was adorable, but definately a handful. He chewed everything he could get his mouth on. He was very anxious and seemed to be going 90 miles an hour all the time. He was completely different than any dog we had had before, but we loved him just the same. We had him fixed at 11 months old hoping that would help to calm him down; not so much. The first time he bit me was the day after he had had his operation. I tried to take a sock from his mouth and he growled, when I didn't back off he bit me twice. We attributed it to the medicine from the operation and didn't think about it again. The second time he bit me I was trying to take a piece of plastic from his mouth. He bit me about three times, I had to go to the hospital to have it cleaned and have a tetnis shot. Our vet had told us, he may need behavioral medication to help calm down his anxiety and possessiveness of toys. We took him to our vet the next day but we were unable to see our vet and saw someone who was filling in. She told us that he was aggressive and would have to be put down. We told her there was no way, asked for the meds our vet had recommended and got ready to leave. The tech (who I now think of like my angel) told us about Canadian Canine Academy and to ask for Randy. I immediately looked it up on the computer and started reading the success stories, and hoped one day I could write one about my dog. Now I am. Through his 8 week course Zorro has changed into a completely different dog. He heels, doesn't pull, doesn't jump on people and he doesn't bite anymore. He sits, stays, lies down, stands and almost has mastered come when called. Haha, no one is perfect. Randy taught not only Zorro but he taught my husband and I how to deal with him. Randy taught us many little things to change in our behaviour, that really made sense and have helped immensely. Without this training I don't know if would have been able to keep him. That would've broken our hearts. But with Randy's help and incredible knowledge we have been set in the right direction. Randy is one if the kindest people I have ever met, and his unconditional love for animals and their owners is amazing. Don't let his seemingly serious, gruff exterior fool you. He is the kindest person to animals I have ever had the pleasure of meeting. He saved my dog and he saved us. We would like to thank you for your excellent and effective work in training Gucci, our Rottweiler. We acquired Gucci from the Humane Society 6 months ago and knew she had great potential but she was nervous, jumpy and quite snappy around people, especially when played with. This was quite concerning given her strength, size and ferocious appearance. We then had her trained by you and now her behaviour has been transformed. She can now be played with vigorously without any snappiness, and she is very relaxed and at ease with people, even new ones coming in the house. She continues to be very alert, playful, obedient and intelligent and we could tell that she enjoyed her training sessions with you as she was always happy and cheerful when we picked her up after training. Thank you for transforming Gucci from a problem dog into a star. I have known Randy Chartrand for one year. My spouse and I went to him for help with our Airedale dog, Badger, a ten year old male, which had been escaping from our garden, attacking cats and presenting a perceived threat to neighbours' young children. Over the course of the next six months we, and Badger enrolled in Mr. Chartrand's Canadian Canine Academy's Beginning Obedience and Advanced Obedience courses, the first through private one-on-one training, the second in a class with other dogs. We learned a great deal, becoming in the process much better able to own and care for our dog. Badger developed vastly improved social skills and lost much of his aggression. We were more than satisfied with Mr. Chartrand and his training methods, an opinion shared by other dog owners who took the Advanced Obedience course. In our travels around the world in the Foreign Service, often accompanied by dogs, we have called on the assistance of a number of dog trainers. None came close to providing the comprehensive approach employed by Mr. Chartrand. We were extremely grateful to Mr. Chartrand when he agreed to give testimony as an expert witness in a court case related to pre-training behaviour of Badger. His eloquent presentation to the court demonstrating his extensive knowledge of dogs and dog behaviour was a key factor in the court decision in our favour. Mr. Chartrand is an impressive individual who excels at his chosen vocation. With his dedication and sense of purpose I have no doubt he could be equally successful in any other endeavour he might embark upon. It would be my pleasure to confirm and expand on the above should this at any time be required. Just wanted to thank you for making a difference in our family's life by helping us solve and control our dog's dominant/aggressive behavior. Three weeks after graduation, Elmo is still doing great! Elmo was 7 1/2 years old when we brought him to you for an assessment. This little Bichon Frisee has been a good dog in general, responding to us relatively well, so we thought... (95 % of the time). We thought we could handle the 5 % just by avoiding certain situations where he would not cooperate. Elmo had "trained" us to never leave anything lying around or he would chew it to pieces. When he got hold of something we could not get it away from him unless a treat was offered. Elmo would never let us groom him, we let the professional groomer take care of that task. One day Elmo went too far, and bit me. After that day I could not trust him, not knowing if he would attack again. We were considering parting with him, but before going ahead with this heartbreaking decision, we decided to seek help and came to you hoping you might have a solution for us. After some obedience classes, some dog psychology tips and lots of practice, we have a submitted dog with no aggressive behavior. Grooming and nail trimming is not a problem anymore. Now we know the techniques to use to get Elmo back on track whenever necessary. You are great! Jake is great! Thank you so much for training him. When I first brought him to your weekly classes, I thought I'd never see him behave, but you did it, and it was fun too! In those days, it was really rough to drive the 50 miles to puppy classes once a week with a loveable, but very carsick 6-month-old puppy in the back seat. Now that he has been through the obedience training with you, he is no longer carsick and is so good with his commands that I have a neighborhood of jealous dog owners. We've kept up the commands at home and now have a wonderful companion and friend. Jake is happiest when he is working. You taught him well. Thank you again for all your hard work. I would highly recommend you and your school to anyone seeking a knowledgeable, professional and compassionate trainer for their dogs. Good luck to you in the future. I hope you will be available should I decide to enter Jake in obedience trials. Dear Randy, Just a note to thank you so much for training our little Miniature Schnauzer Sam. We were at the end of our rope with him at just 6 months old, and came to you as a last resort. He was having "accidents" all over the house, and running out the door and down the street at every opportunity. You assessed him as being too dominant, and we sent him to you for 2 weeks of boarding training school. It was hard to leave him for two weeks, but the difference in him when we got him back was incredible. He has been home for 3 weeks now, and is like a different dog. He sits quietly at the door when it is opened, and waits. He comes when he is called, and is very calm in the house. He enjoys practicing his new skills. Today he laid very still and didn't move while I trimmed his face with scissors! My brother is doing private lessons with his dog at Canadian Canine, and is very pleased with what he is learning as well. I would recommend you to anyone who is having problems with their dog. When I called you in February I was feeling hopeless and very discouraged. My 2-year-old Jack Russell Terrier was completely out of control, making my life and his own miserable, not to mention the lives of all my new neighbors and their dogs. Jocko was a great, affectionate little dog inside the house and with people he knew well but once outside he was truly a terror. He gradually became increasingly aggressive toward other dogs and people. A simple walk became a challenge…what would Jocko do this time? Always Jocko could be found out at the end of his leash snarling, lunging, growling and yes sometimes snapping at dogs, people, bikes, strollers even cars. Nothing I did seemed to make a difference. I frequently worried that eventually he would bite someone or injure another dog. We had already been through two different obedience schools but found their methods either abusive or simply ineffective. Honestly, I was at the end of my rope. Randy, you gave me the encouragement from our first meeting that Jocko could be helped and I hung on to that hope. I know things would only get worse unless something changed. I really enjoyed the private lessons and implemented those changes at home that you suggested. Rather quickly I noticed positive changes and now 2 months after starting his training, Jocko is a new dog! He heels beautifully when we go for a walk and socializes well with other dogs and people. I now have the confidence in Jocko so that we can participate in more activities. We are enrolled in your agility classes and we both really enjoy it and Jocko gets along with everyone! Randy, I can't begin to tell you how thankful I am for what you have done for us. I cringe when I think of jocko's past behavior and the direction things were headed. Initially I felt Canadian Canine was my last hope, now I realize it should have been my first choice. I now realize what a difference good training makes. 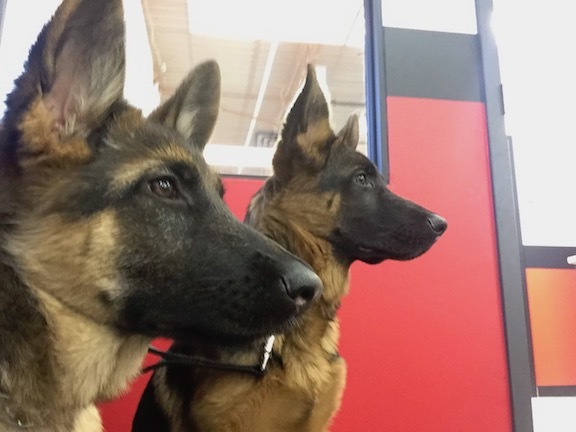 At Canadian Canine I witnessed my own dog and others excel in training that is always motivational and where there is always much emphasis on positive reinforcement. I HIGHLY recommend Canadian Canine to all dog owners. This training has been invaluable to me and I look forward to continuing in your advanced classes. It is now many weeks since I brought my standard Schnauzer, Vesta, to you to correct her off-leash aggressiveness against any dog bigger than she is, as well as her embarrassing habit of chasing and barking at any person not accompanied by a dog. So here's an update on her post-training behaviour. Vesta has ceased lunging at other dogs and forcing them into submission. She still would like to chase bicyclists and bark at people, but I call her to me and make her sit and stay until the temptation is passed then praise her for being a good dog. Her reputation at the Bruce Pit is improving daily and I no longer dread letting her have the off-leash runs she enjoys so much. I am very grateful to you for helping me understand that her aggression was due to fear not sheer nastiness and for the tips you gave me to have her recognize me as her leader - I continue to practice them. It's wonderful having a happy dog I can be proud of. Many thanks for the fine job you did with Ginger and me. With a 6 year old German Shepherd mix that was a stubborn "puller" we felt that we were destined to be dragged around our neighborhood going from dog fight to dog fight. The results were almost instantaneous and we now have a proud dog. I just wanted to again say how happy we are that we came to you for help with Frodo.It's been almost 2 years since you've worked with him and he is still a perfect dog. We recently had to take him for TPLO surgery and I don't know what we would have done to keep him still and quiet without your training. If you remember, he wouldn't even do a down command before you seen him. He listened every time we told him to go lay down if he was getting too active while he was healing, especially in those crucial first few weeks. He went in for his first recheck after his operation on Tuesday. They said he is healing perfectly! Hopefully after he gets his next recheck he can start going back to daycare. His daycare provider says Frodo is the best behaved dog in the group and she wishes they were all like him. Thanks again Randy and I hope everything is going well for you and your family. I wanted to tell you again how pleased I am with the improvement in Ginger's behavior since her return from your 2-week boarding school program. As you know, Ginger was a stray hound-mix that we acquired from the Humane Society when she was about 8 or 10 months old. Not knowing a whole lot about dogs at the time, I came to realize, after a lot of reading and experience, that we also acquired a behavior problem when we chose Ginger as our dog. Her breed(s), age, and situation were pretty typical indicators of the problems we would have with her - extreme stubbornness, lack of focus (i.e. goofiness) and a severe case of separation anxiety - which showed itself in her fear of confinement. I could never accustom her to a dog crate and had to resort to a custom-built dog-proof room in our basement, persistent escape attempts (chewing walls, doors, etc,) and unbelievable destructive chewing when she did manage to escape (furniture, rugs, bed, clothes). She was generally a nice dog - friendly, loveable and affectionate - but her problems didn't get any better as time went on, they just got worse. I tried weekly obedience classes (repeated the basic one twice). I tried natural, herbal remedies to reduce the anxiety. We made many trips to two vets, had blood tests analyzed, tried anti-anxiety medications, thyroid medications. We even did a fax/phone consultation with a famous vet in the U.S. Along with the medications, an all-natural dog food was recommended in case she was reacting to additives. We gave her lots of exercise. Nothing seemed to help - in some respects, she got worse. In all the reading I did, and in all the vet's recommendations we received, a common suggestion was obedience training. All the advice suggested that without obedience training and daily reinforcement, the other measures would not be entirely successful. We did try to maintain some level of obedience training but I think that Ginger just needed more intensive training and training by someone with experience with difficult dogs. We were just not experienced enough and not able to give her an intensive period of training, which she really needed. This is where you came in. Upon a recommendation, I contacted you and enrolled Ginger into your 2-week boarding school program. I was apprehensive about whether or not anyone or anything could make a difference in Ginger's behavior. When I came back and picked Ginger up she was understandably over-excited to see me, and not really thinking about her obedience. You worked with her for a few minutes and got her to settle down and concentrate. Once she was focused I took over and led her through her exercises - heel, watch, sit, down, stay, etc. I was amazed at her concentration and focus and precision (this dog was labeled "goofy" by a former trainer). Once at home, she was calm and obedient. For the first time in her life I was able to tell her to go into her crate and she went in without a fight. Once in her crate I was able to shut the door of the crate and she went in and simply curled up (without going berserk and trying to escape). From time to time she even goes into her crate on her own, without being told to. It really means a lot to us - having a secure place to leave Ginger when we can't be around (and a place where she is reasonably content). It eliminates the anxiety and destructive behavior that is so hard to live with. Ginger continues to be much easier to live with. We practice obedience with her (aiming for daily reinforcement). We do have to keep on top of her - she has a stubborn nature - but she will listen and respond if she knows we mean business. Thank you again for the excellent work you did with our dog. The results we see in Ginger would never have happened without your expertise and experience and the intensive nature of the training she went through at your academy. UPDATE: It is now a year and a half later and Ginger's behaviour is no longer an issue. She is basically obedient and follows all the important commands (the "Come" command still only works in a controlled environment, not outdoors). We have a good life together - my husband, Ginger, the cats and myself. When we leave Ginger alone in the house she goes into her crate on her own (we've given her a big crate in our bedroom). She appears to be relieved to be in her crate, and simply settles in for a nap. She does not become anxious and bark or chew the door or try to escape - all of which were major problems before seeing Randy. When we return home she waits patiently for us to make our way upstairs to let her out of the crate. Things have been so relaxed at home that we've been able to foster several cats and two dogs through the Humane Society over the past 14 months. This never could have happened in our old life. It took all our patience and energy just to deal with Ginger. Our vet has also noticed a big improvement in Ginger since spending time with Randy. From our perspective this has been a real success story and we're thrilled with the outcome. Thanks again to Randy and Canadian Canine. Intimidating guests in the house by sitting in front of them and staring them down. I am writing to let you know how my dog "Ben" is doing. It has been about a month since I picked him up from his two-week stay with you and things have been going very well. His walking improves everyday and his sit stays and down stays have been wonderful around the house. I work 9-5 everyday so I have him going out with a dog walker for an hour and a half three times a week. This has kept him much happier while in the apartment during the day. He seems like a more content dog now, I think it is a relief for him to be told what to do and he appreciates the praise he gets for being such a Good Dog. I must say that this was all so worthwhile and you come very highly recommended in my house. Ben still tests me from time to time but I have the skills to keep on top of him. We hope to find classes like yours in the Toronto area so we can keep on improving. When I left Ben in Ottawa I was feeling very guilty and worried that I had made the wrong decision but I now know that it was definitely the right decision and I don't know where Ben would be today if I hadn't brought him to you. Ben missed you so much when we left he was actually a bit depressed for the first couple of days. He looked so great when I picked him up, better than ever to tell you the truth. I hope this letter finds you well and Ben and I hope to get to Ottawa sometime in the future for a "refresher" with you. When you are finished your video I would love to get a copy from you. Take care and we'll talk soon. I can't thank you enough for the incredible job Canadian Canine has done on my two German shepherds Barka and Bono. The changes are astonishing and I am now very proud and confident to take my dogs anywhere. Your school was my last resort before giving up and getting rid of my dogs. I love them dearly and am very grateful that I was able to keep them. I have so much more pleasure out of my dogs since their training. My dry cleaning bill has been reduced to almost nil, my home no longer looks like the aftermath of an earthquake that hit 9.6 on the Richter scale and I no longer have to go running outside every 5 minutes to stop them from barking. You promised me I would be satisfied with the results and you most definitely came through. I recommend your school to everyone, especially those who compliment me on my dogs. You are no doubt the master of dog training. Our guests and friends are very impressed with our little Oliver's upbringing. Randy has proven to be a magnificent trainer and we feel very fortunate to have found him!! I thought I would share a story with you about our dog, Jake. I had to take him to the vet's last week for an ear problem, now my vet is also a good friend, and the last time he saw Jake was back in early Oct./07 when he came to the house for a visit. At that time Jake was about 5 months old, with little training, and socialization, so when the vet arrived, Jake barked at him non-stop for 45 min. to 1 hr., no matter what I did to correct it. (it was unreal) . When I showed up at the vet's office last week, they showed us into a room, and I put Jake in a down & stay position. When the vet walked in, the dog sat up, and I told him to stay, which he did, the vet then went on to ask me if this is the same dog, which I said of course. He couldn't believe me, and at that time he sat down on the floor at the other end of the room. I told Jake to "go see", and he got up and walked across the room to the vet and sniffed him, then licked his face, then laid down beside him for the rest of our appointment. On the same note, I was at The dog club we go to this afternoon, and had compliments on how well Jake was doing in his training and how far he has come along for his age. He is 8 months. (Other dogs are older with less training, and it shows.) So thanks again, and we will see you next lesson. My family adopted Lewis, an 8 month old Border Collie, from the Humane Society and were given no information about his past. The first week we couldn't believe our luck as Lewis was behaving as a model dog. However, it wasn't long before Lewis started to show dominant tendencies which on several occasions manifested in aggressive behaviour towards me, my husband and other dogs. All of a sudden, walks became a battle of the wits and the only way to suppress the leash biting and other aggressive behaviour was to never leave home without a water bottle laced with vinegar. It was only then I started to view the squirrels, rabbits and other dogs in our neighbourhood as the enemy, I knew we needed help! After an eight week one on one basic obedience course with Randy, Lewis is now a happy dog who understands what is expected of him. Lewis is a joy to take out on walks and even paces me on runs several times a week passing squirrels and rabbits on a loose leash. He also loves playing with other dogs at the local dog park. As for me, it goes without saying that I have kicked the vinegar bottle habit. First let me ask you, what did you do with the dog we left with you? Because the dog that we got back is a totally different dog.This dog listens, he is MUCH better behaved and is a lot calmer now. We had tried nearly everything with our beloved lab mix, Charlie. Check chains, Halties, more treats, fewer treats, even growling at him...all of these techniques worked for a while, but our boisterous pup was too smart. He was on to our game. We wanted control, and he wasn't about to give it up easily. Charlie was a very dominant dog, especially when it came to dogs (and squirrels, rabbits, cats...anything that moved, really). He was never vicious but had a seemingly uncontrollable desire to get to them and would do whatever it took to accomplish this - practically strangling himself in the process. We got to the point that we were frustrated and scared to take him outside of the house because of his uncontrollable and unpredictable reactions to everything in sight. We were literally at our wits' end. It was at the point that we were considering giving Charlie up if we couldn't get him under control. It broke our hearts just thinking about it. We were so attached to him, in spite of all his issues. And, he was our responsibility - we couldn't pass him on to someone else, knowing his unpredictable ways. Fortunately, before it came to that, we happened upon Canadian Canine Academy. We had a consultation, and after just a few minutes with Charlie, Randy told us "Sure, we can fix this". He seemed pretty confident, so we gave it a try. Six months later, our Charlie is a changed dog. And we are changed owners. Randy helped us to realize that it's not about fancy collars or gimmicky techniques. It's about showing consistent assertiveness and leadership to your dog. It takes hard work and commitment from both dog and owner, but it has been well worth it. These days Charlie is still a very energetic and excitable dog. However, now we have learned to control his behaviour, rewarding him when he's doing what we want and correcting him when he acts up. Walks have become a mostly pleasurable experience for all of us now. Our friends and family can come over to visit with no fear of being eaten (or at least licked to death). And, Charlie's biggest accomplishment - he can now be around other dogs, in a controlled environment, with minimal psycho-freak outs. 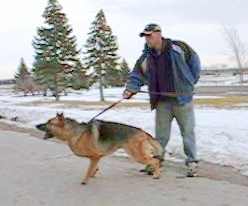 Thanks to Randy and the Canadian Canine Training Academy, for all of your help. i know you are busy, but i just wanted to drop you a line on how little Sadie is doing..
after our last class (tuesday morning at 11) Sadie threw a temper tantrum of mass proportions. Tearing around the house at a million miles an hour, barking, growling, knocking everything over.. the whole nine yards.. the cat was REALLY impressed. I wasn't quite sure how to handle it.. i didn't want to chase her around.. but thankfully she had her leash on, and i managed to stomp on it when she was halfway down the stairs. She bailed bigtime, and when i hauled her back over to me.. i had a different dog. The shift has happened. she wouldn't let her title go without a fight, but now I am the boss.. even my husband has noticed that he has slipped down on the totem pole. I can't believe the sucess that i have had in the past three weeks.. especially in the past two days, as she now acts with me the way she has always acted with you. we are looking forward to our next 5 visits!